Our first term of the new school year started very well. As usual there were many more requests for places than we could manage, which is good for us but sad for those children we could not accommodate. As we gain more experience the settling-in period is less of a challenge and we were soon into the routine. It is worth remembering where we started – with 28 children and almost no materials to work with.Now we are very settled in our building and the last work was finally completed this term. A new classroom, currently used by a new adult literacy class was completed in January and some bright new murals were painted in the front area, giving the children something to talk about. This year we have one hundred and eighty children in six nursery classes each of thirty children. We are supporting one hundred children in primary school, seven students in secondary school, two young people in University and 24 adult literacy students. We now employ a great team of fourteen staff – teachers, class assistants, cook guard and cleaners. We have come a very long way since we began! 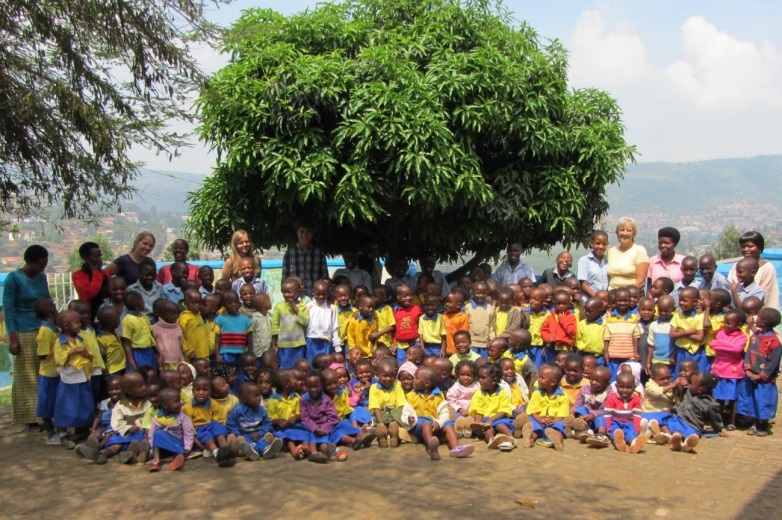 Below are the majority of Nursery 1 and 2 with teachers, staff, some of our Primary children and three of our volunteers who worked with us for a few weeks in February and March. 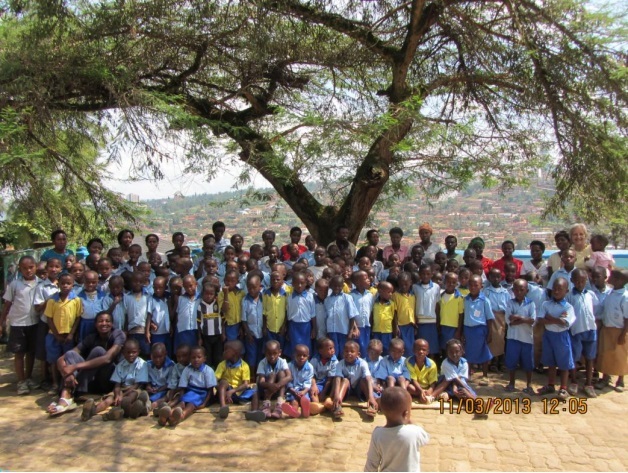 And here are the Nursery 2 children, with some of our Primary children and the staff. I know I have said this before but we really are very lucky with our volunteers; the children are still talking about their holiday fun with Vincent, Richard, Andrew and John. Recently some of the Primary children were out and about in town with their latest ‘muzungu’ friends John, Beth, Jenny and Josh having a lovely time and enjoying some new experiences. John will be with the project until July working with the Primary children. On behalf of everyone I thank our volunteers and staff for all their hard work and dedication, making our school a very special place. We must not forget the many volunteer friends in the UK and other places, working tirelessly on our behalf in many ways – organising events to raise funds, collecting items to send out to the project – thank you so much. Thank you very much also to those kind people who sponsor our children and our donors, we cannot do this without you.